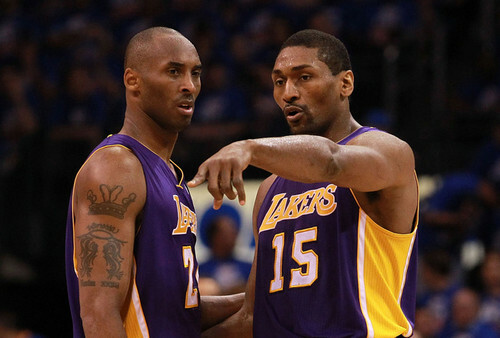 Metta World Peace and Kobe Bryant. . Wallpaper and background images in the Los Angeles Lakers club tagged: los angeles lakers los angeles lakers basketball nba kobe bryant metta world peace. This Los Angeles Lakers photo might contain баскетболист, basketeer, cager, певец, ведущий мяч, and дриблер. Los Angeles Lakers power вперед Ryan Kelly enjoys HYDRIVE Energy Water before the ESPY Awards.